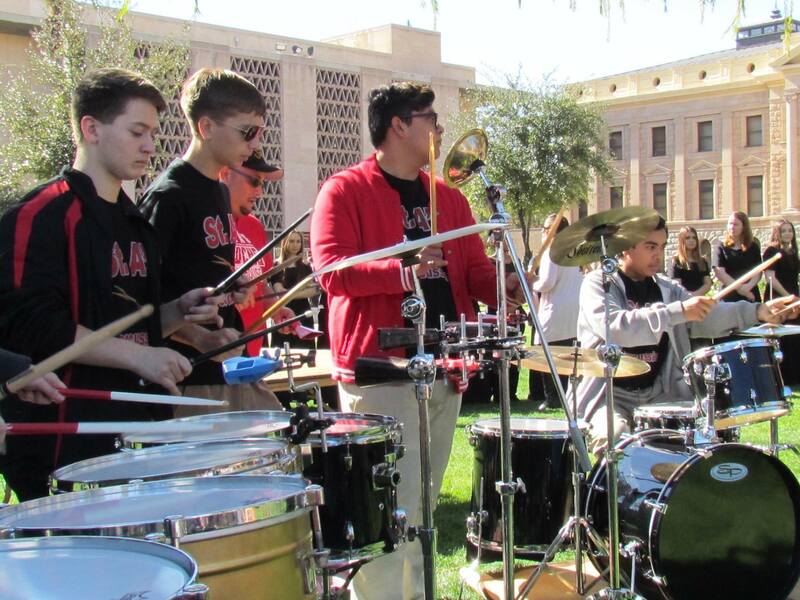 The 2018 Catholic Schools Week rally was as exciting for all of the 1,000 plus enthusiastic Catholic School students in attendance. 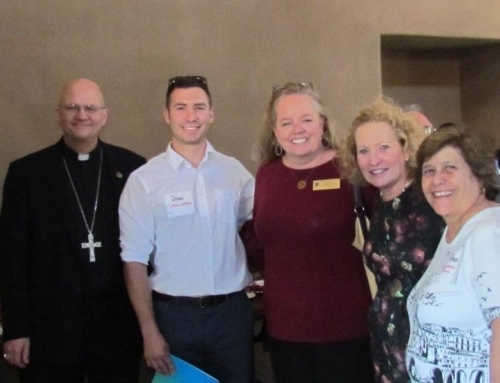 Four Bishops, three Catholic School superintendents and supportive state legislators were present to address teachers, administrators, religious, priests students, parents and volunteers who share in the love of our values-based educational programs. 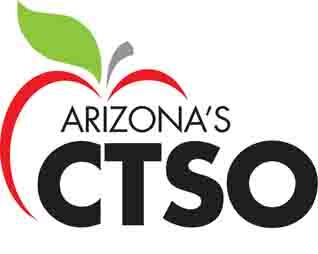 Thanks to Arizona’s Tuition Tax Credit for private education, our schools are thriving and our students, who are the future of our faith and our communities can fulfill their desires for a quality education. 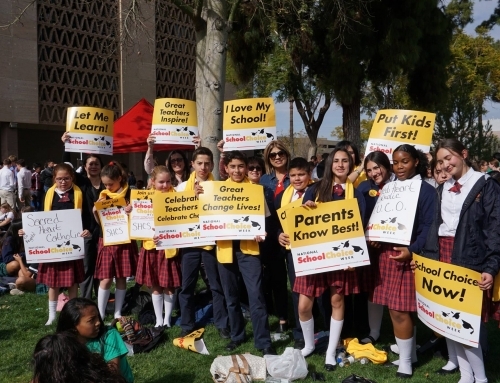 Rally speaker Luke Williams, a student at St. Elizabeth Ann Seton School in Tucson shared with those gathered his appreciation of his excellent education at a school where he feels safe and supported by faculty and friends. The Most Rev. 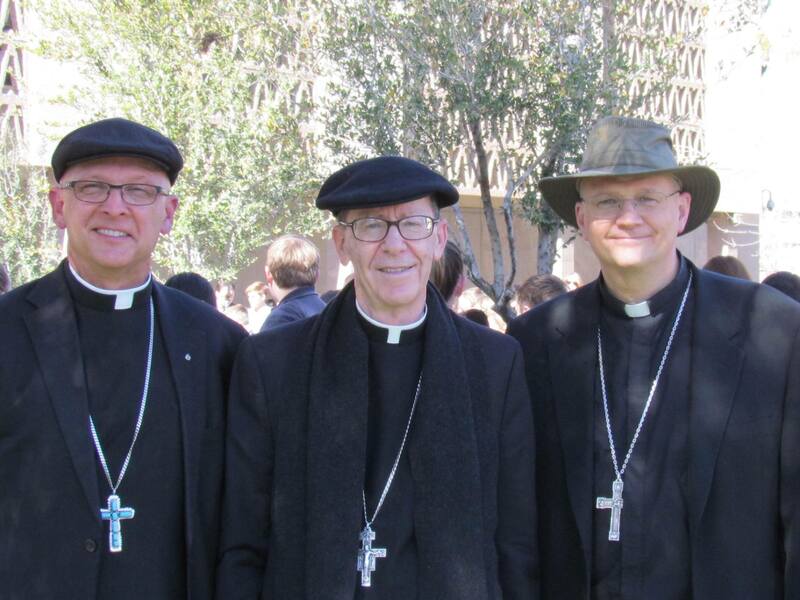 Edward J. Weisenburger, Bishop of Tucson spoke to the crowd as did the Bishops of Phoenix and The Diocese of Gallup, Thomas Olmsted and James Wall, respectively. 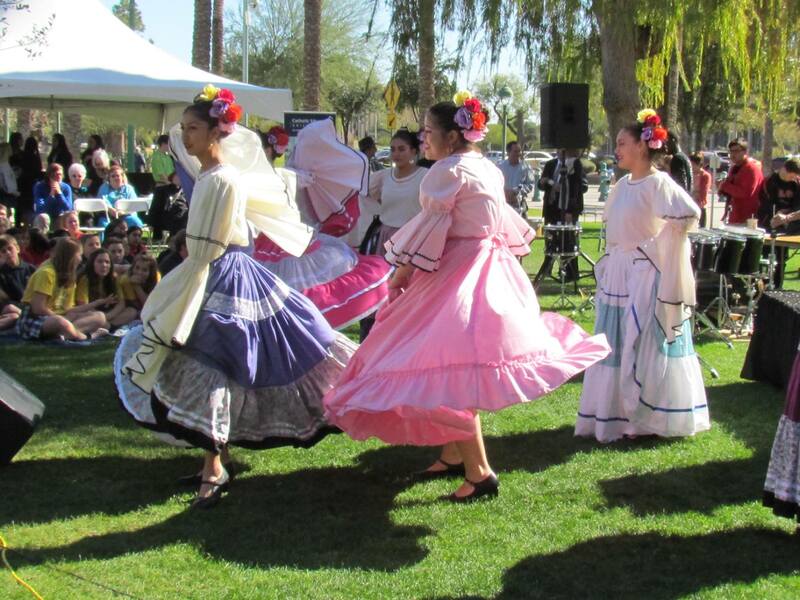 The folklorico dancers from Lourdes High School in Nogales showed off lovely flowing moves and the St. Augustine High School drumline wowed the crowd so much so that they were the only performing group asked for an encore. CTSO Board member and Pastor of Saints Peter and Paul Parish, Rev. 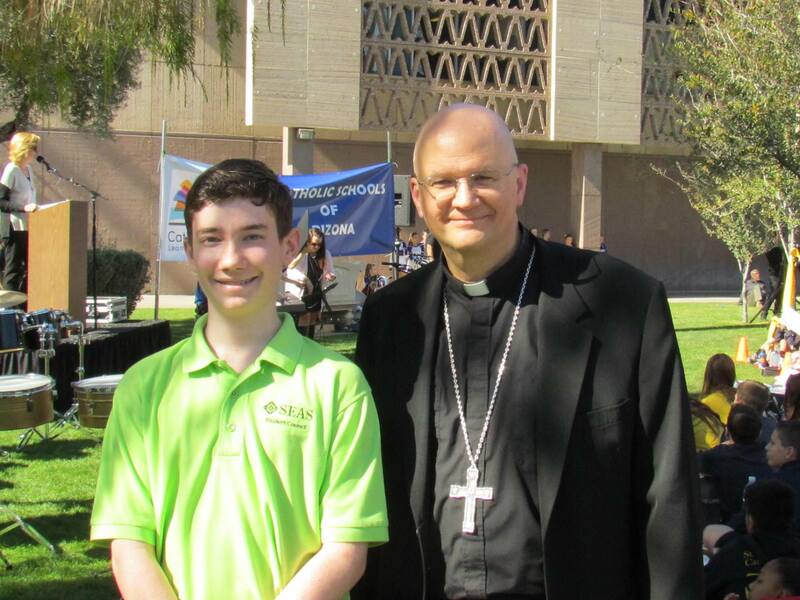 Pat Crino shared a bit of shade with Auxillary Bishop of Phoenix Eduardo Nevares. 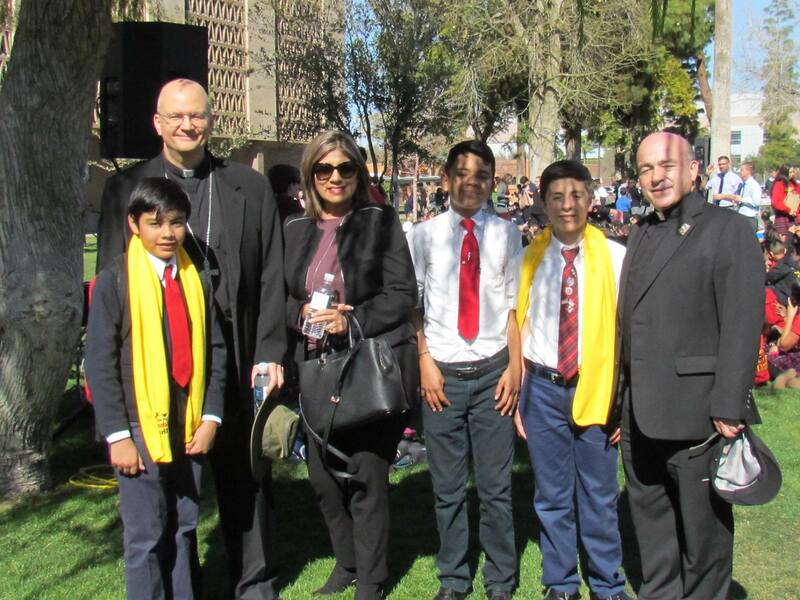 Bishop Weisenburger and CTSO CEO, Gracie Quiroz Marum enjoyed visiting with students from Sacred Heart School in Nogales. Sheri Dahl, Superintendent of Schools for the Diocese of Tucson thanked everyone involved with Arizona’s Tuition Tax Credits. 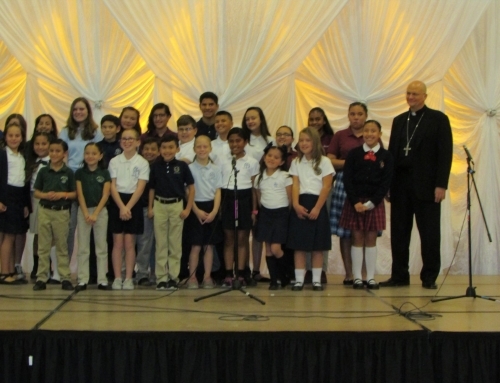 Thank you to the schools from the Diocese who sent students who represented us exceedingly well among students from across the entire State of Arizona: Our Mother of Sorrows, Sacred Heart of Jesus, Lourdes, St. Augustine High School, St. John the Evangelist School, San Xavier Mission School and St. Elizabeth Ann Seton.